Julia had her usual tough Wednesday routine (gym at school and 2 hours of dance class after school), and tonight she was a bit grouchy and tired. Still, this is nothing like what we had to deal with during the spring and summer. Julia's also complained a couple of times about having trouble seeing the blackboard in school. 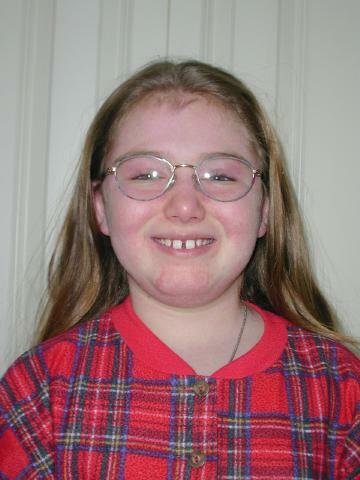 This is actually no surprise; I had to have glasses when I was in 4th grade, and Julia's mom in 6th grade. Last time she had her eyes checked, her vision was starting to be slightly less than normal, about 20/25. We'll get her an appointment to get her vision checked. Julia got her Methotrexate shot this morning, again without EMLA and without incident. She was still a bit sluggish from yesterday, but still had a good day in school. We had a Marriage Encounter group meeting at our house tonight, and it turned out to be a blast. Julia counldn't stay up for the fun because it's a school night (and because it's supposed to be for the couples), but she had a great time answering the doorbell and welcoming everyone who came. Julia had her eye doctor appointment today, and sure enough, her vision has deteriorated a bit, to about 20/30. The doctor said that she doesn't technically need glasses, as 20/30 is still considered "normal". Still, she's having trouble with her vision at school, so he wrote us a prescription for glasses for Julia. Julia has a major school project due next week. 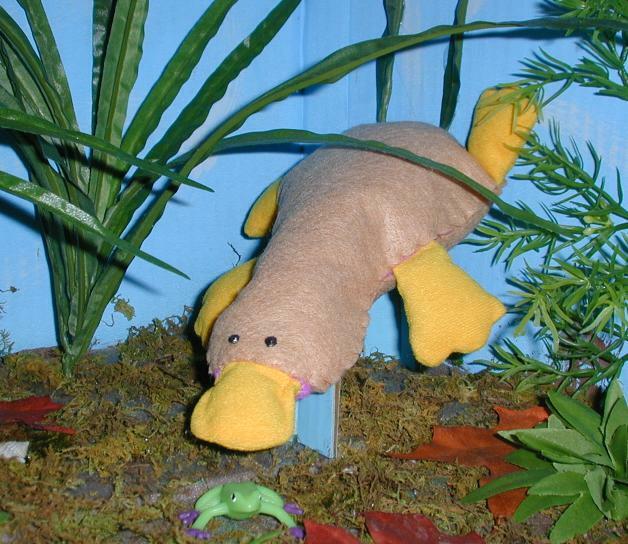 Everyone has to write a report on an animal; Julia picked the Duck-Billed Platypus. Interesting choice! She's really been knocking herself out writing this report in the last couple of weekes, and the "report" part is almost done. She did most of her research on the Internet, and the report is actually very good. I mention this because she was up rather late tonight working on the final paragraphs. She had a lot of energy for a Wednesday. Methotrexate shot was given to Julia this morning. No EMLA, no problem. She also had a lot of energy at the end of the day. I guess the old problem we had with her getting tired at the end of Methotrexate days is no longer a problem! We also went to pick out some glasses for Julia. Finding frames she likes took all of 90 seconds. We took a couple of minutes to check out a few others, but went back to the same ones. They'll be ready within a couple of weeks; photos will be posted as soon as they're available. We tried to do as much of our Christmas shopping online as possible this year. Most things can be more easily bought from a web site, especially books, videos, electronics, and more. Julia's school even gets a kickback from an outfit called SchoolPop.com. We just sign up with Julia's school on the site, then forward copies of the email receipts from the supported merchant and they give a percentage back to the school. Works great! Still, there are some things that need to be held and seen before you buy them. For me, stocking stuffers fall into that category - little gifts that must fit into a stocking. We made a trip to the mall, and I get the feeling that we weren't the only ones doing a lot of online shopping. We got there early, soon after they opened, and left shortly before lunchtime, and it just plain didn't seem too crowded. 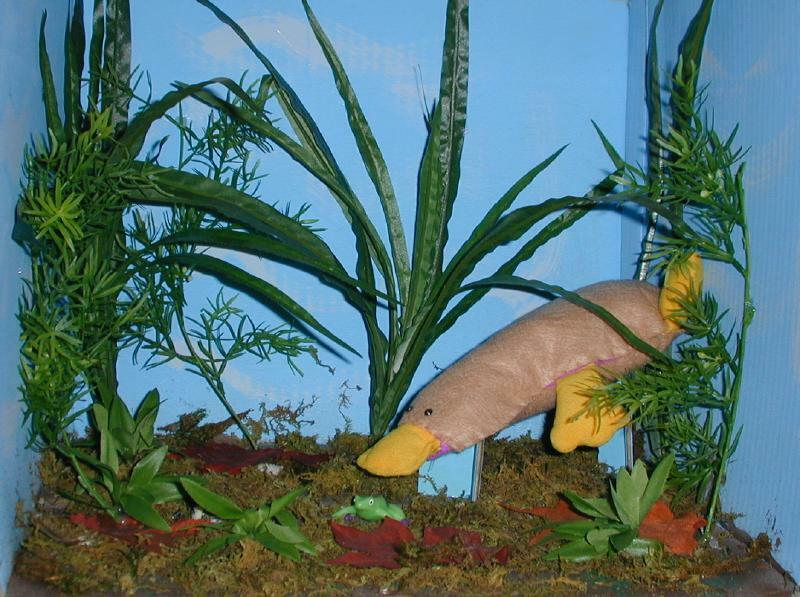 Finally, today Julia finished her school project on the Duck-Billed Platypus. Wow!! her report came out great. She did all the research herself, and all we did was help her clean up the grammar a bit, and integrate the pictures into it. I wanted her to publish it as a web page, but she didn't want to. The diarama can out great! Mom helped out with the hot glue gun and the platypus outfit for her Beanie Baby, but Julia designed the layout. Fantastic. Click on the thumbnails below for a bigger photo. Julia had what's hopefully her last visit to the podiatrist today. Her warts are gone. All he did was look at them and pronounced her cured. He suggested spraying her feet with deodorant at night. That will keep them dry, which will help since warts tend to grow more easily on damp feet than dry ones. Time for another infusion at Children's Hospital. It's been 4 weeks since the last one, and Julia seems very strong - nearly normal again. Today's visit turned out to be rather special. We not only got to see Dr. S. and Dr. A.W. again for the first time in almost 2 months, but there were 2 other JDMS kids in the CAT/CR getting infusions. Once Julia and the other kids were all settled in, all us JDMS parents stepped into the hall and had a little meeting. One of the parents was the mom we'd met last time, and the other was someone I hadn't met before. We all just stood there and chatted about our kids, our jobs, whatever. It was weird, I was like the "veteran" parent, having been diagnosed almost 2 years ago (3/98); the other two were diagnosed earlier this year. It was also very good to share about stuff that no one else, not even the doctors, really understands. It was very much like being at the MAA Conference again. Dr. S. came by while we were talking and commented how our little meeting represented "about 5% of all the active JDMS cases in the country." That's probably an exaggeration, but not too much of one. We broke up as Dr. S. visited each child in turn. Dr. A.W. came by soon thereafter and sat and talked with Julia and me. She wasn't seeing any of the other two JDMS patients, so she just hanged out with us. She commented on how Julia's rash looked so good now, and it's true - she does look good. Julia also gave her a Christmas present - a booklet of hand rubber-stamped House Mouse pictures that Julia had colored in herself. It really came out beautifully. Dr. A.W. spends a lot of time with mice in her lab, and she got a real kick out of the booklet. She promised to show it to all her co-workers in the lab. Julia also made a couple of candy cane ornaments and gave them to Dr. S. He seemed to like them very much, too. Dr. S. soon came over and wanted to check Julia's sterength. We got Julia off of the infusion bed and sat her in a chair. They checked her neck, leg and arm strength and Julia was even able to stand up without using her hands to help! She hasn't been able to do that for a long time, and she was thrilled. The doctors were happy too. They asked me what I thought, and I said Julia is close to normal strength, maybe 90%-95%, and they agreed with that assessment. Dr. S. reminded us that he said that we'd be off of infusions by the end of the year if all went well. If today's numbers are good, and he said that he doesn't expect otherwise based on the clinical exam, then this would be our last infusion for the time being. Woo Hoo! We're going to schedule an appointment in the Clinic in about a month. Dr. A.W. promised us blood work results in the next day or two, and then she's going home for the holidays for a couple of weeks. We can call the clinic to get the results of the rest of the tests next week. At the end of our appointment, it was almost sad to say good bye to the CAT/CR staff. We've gotten to know so many of them, and they've all gotten to know Julia. They gave Julia 2 Christmas presents before we left, a Pok�mon keychain, and a paint-it-yourself flower pot. It was a nice gesture. Don't tell anyone there, but we have a Christmas card for them all ready to be mailed, including Julia's picture. There were hugs and goodbyes as we left, and promises to visit them when we're in the hospital. Our heartfelt thanks to everyone in the CAT/CR, including Jennifer, Pat, George, Cheryl, and everyone else whose name I can't remember now. You guys are great. Dr. A.W. emailed us the lab numbers today - Wowza, they are fantastic!! Julia's CK is now 88, the lowest it's been since November of last year. The cancellation of the infusions obviously stands! The rest of the numbers are WBC 6.84, hematocrit 37.3, and platelets 392. The Aldolase and von Willebrand's Factor test will be in next week. In the meantime, I can make a clinic appointment for next month some time. Mom gave Julia her Methotrexate shot this morning. She complained more than usual about how much it hurt today, but then again she was up later than usual last night helping us finish our Christmas cards. It always seems to be worse when she's the most tired. I was looking back over the past 6 months. It's been quite a ride! Julia has received 15 Solu-Medrol infusions. That's 15,000 milligrams of methylprednisolone. It sounds like a lot, and it is a lot. Julia has been very brave throughout the whole time. I'm so very proud of her, and so happy that she's finally doing so well. My company hosted a Holiday Party today. We took Julia, and we all had a very nice time. There was a magic show, snacks, an organ grinder with a real monkey, and Santa handing out bags of goodies (many with company logos on them). We had a very nice time. I have today off from work, and today is also the first day of Julia's Christmas Vacation from school. Mom has to work, so we decided to drive into Boston for a reason that has nothing to do with JDMS for a change. We took the morning to visit the New England Aquarium. We got there a few minutes before they opened at 9, and while we were waiting for the ticket office to open, we hung around the seal tank, which is outside. They seals put on a special private show for us! The followed us back and forth across the tank, and they obeyed some hand commands. If Julia moved her hand in a circle, one of the seals would dance in a circle for us! It was very entertaining. It turns out the public school is still in session, so we basically had the whole place to ourselves. It was great! We could look at whatever we wanted without dealing with any crowds. Nice. The best was the hands-on tank. It was just the two of us and the Aquarium guide there to answer our questions and show us cool stuff. It turns out the animals are most interactive first thing in the morning before they get poked and prodded all day, and Julia had a great time there. After the aquarium, we had a mice lunch out and then went home to wrap Christmas presents. Merry Christmas, everyone! Click here to see Julia's Christmas message. Julia was actually able to do a situp on her own today!! This is the first time in many months since that's happened. Good stuff. I was playing with my new toy and now you can all see what Julia looks like with her new glasses. I called Children's hospital and finally got the rest of Julia's blood tests back. They are great - Aldolase is 6.3, down from 8.3 back in November, and the von Willebrand factor test was 135. The vW was the only worrisome number back in the November batch, at 195, so it's great to see this one back down to normal, too. This means that we will stick to our plan of dropping the infusions, and start working on tapering the oral Prednisone after our next office visit. Copyright © 1999-2000 by Ralph Becker <ralphb@whoever.com> send me Feedback!